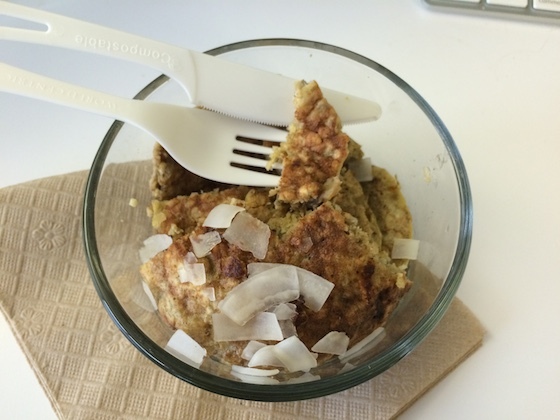 Yesterday morning I packed up some of my protein pancakes to eat when I got to work. When I stepped outside to walk to the office, as I have been, I was shocked to see that it was drizzling! Summers in San Francisco really are as cold as they say. I jumped on the bus instead, but by the time I got downtown the drizzle had stopped so I was able to walk around for about 30 minutes before heading in. I heated up the pancakes for a couple of minutes and they were perfectly delicious and filling. 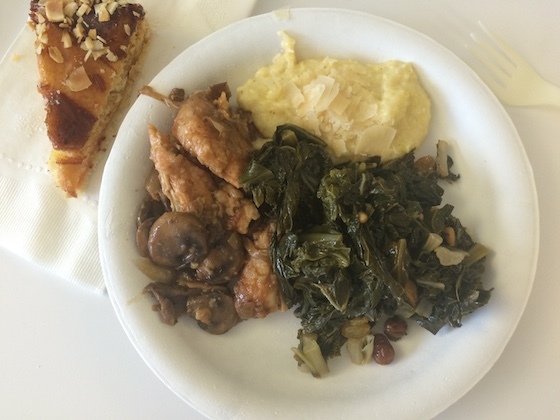 I also managed to get outside and walk for about fifteen minutes before lunch, which was Italian: chicken and mushrooms, polenta, and a big serving of swiss chard. The polenta was particularly delicious. Plus a small sliver of orange almond tart. 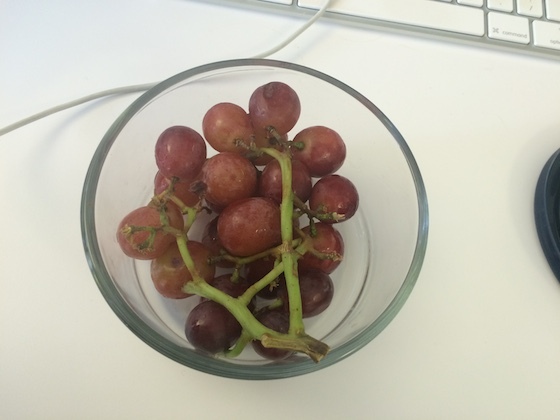 I enjoyed these red grapes for a snack in the middle of the afternoon. I brought them from home because I’ve been pretty disappointed with the fruit selection in the office kitchen. After work I headed to Trader Joe’s to pick up a few things, then walked home from there. My commute is about half as long as it used to be, which is awesome! When I got home I wasn’t quite hungry yet, so I settled in to write for a while before preparing dinner. 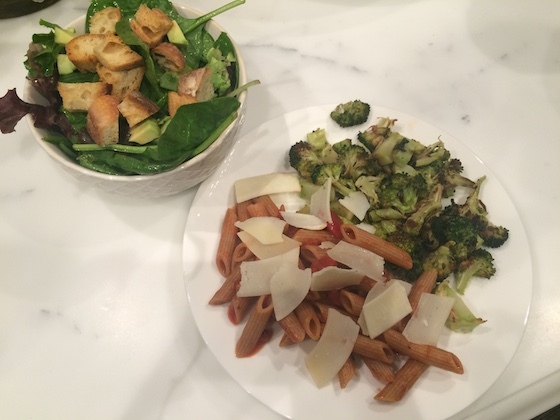 Once the hunger hit, I cooked whole wheat penne pasta with TJ’s tomato sauce and parmesan cheese, heated up some leftover roasted broccoli, and prepared this salad with avocado and homemade croutons. I threw together the croutons while I was roasting the broccoli: just slice up some baguette into chunks and place on a cookie sheet, spray with coconut or olive oil, sprinkle with salt and herbs, and bake at 400 degrees for about 15 minutes. They were a great way to use up some stale bread and the perfect crunchy addition to my salad.